The construction of Babbacombe Model Village, Torquay began in 1963. Since then it has been a very popular attraction for visitors. The Model Village offers great experiences such a “Exploring a World in Miniature, Sound & Animated Effects”, “4D Special Effects Cinema”, “Crazy Golf” and much more! Café Reality was contacted by Babbacombe Model Village to help be part of their refurbished Gulliver’s Cafe & Shop. Having chosen our “Moby Bistro Set” as a favourite, we were happy to assist as much as we could. The Moby Bistro Sets consist of 4 durable poly chairs and a square café table at 700mm sq with a chrome trumpet base. Anthracite and Green chairs were chosen with an Italian Walnut Table top, all of which complement the award winning gardens in which the model village is surrounded. The colours chosen also offer a fresh, contemporary look and style that has become a favourite for the guests. 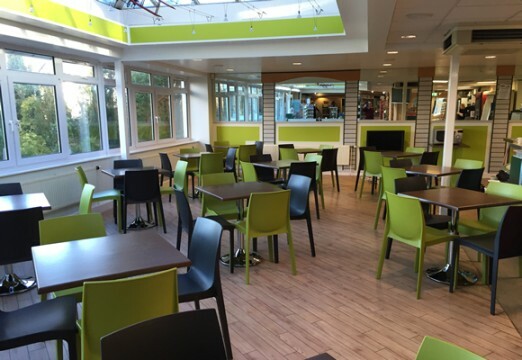 ‘I was really impressed by the level of service provided by Café Reality, from the initial contact to provision of samples and finally the delivery of the order, which was exactly as expected.